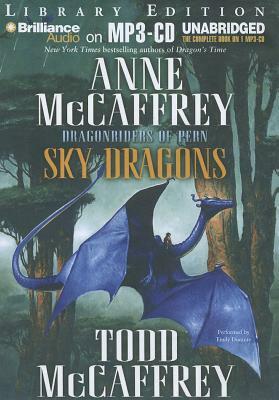 From the "New York Times" bestselling mother-and-son team of Anne McCaffrey and Todd McCaffrey comes the final installment in the riveting Pern saga that began with Todd's solo novel "Dragonsblood." Now, with all of Pern imperiled by the aftereffects of a plague that killed scores of dragons and left the planet helpless against the fall of deadly Thread, the only hope for the future lies in the past. There, on an unexplored island, a group of dragon-riders led by Xhinna, a brave young woman who rides the blue dragon Tazith, must battle lethal Mrreows and voracious tunnel snakes to build a safe home for themselves and the dragons, whose offspring will one day if they survive replenish Pern's decimated dragon population. But as the first female rider of a blue dragon, and the first female Weyrleader in the history of Pern, Xhinna faces an uphill battle in winning the respect and loyalty of her peers especially after an unforeseen tragedy leaves the struggling colony reeling from a shattering loss. Amid the grieving, one girl, Jirana, blessed or cursed with the ability to foresee potential futures, will help Xhinna find a way forward. The answer lies in time or, rather, in timing it: the awesome ability of the dragons to travel through time itself. But that power comes with risks, and by venturing further into the past, Xhinna may be jeopardizing the very future she has sworn to save.